Computers have put the power of the movie studio onto the desktops of anyone with a burning desire to be the next Orson Welles. But with technology changing so quickly, how can the budding movie maker on a budget keep up with such trends as high definition television and DVD's? 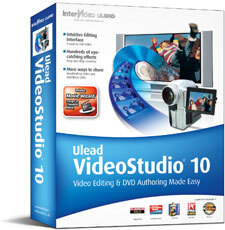 One way is with Ulead's VideoStudio, now in version 10. Ulead (perhaps not surprisingly) targets VideoStudio at more than just entry level artists (it's actually quite sophisticated), but that doesn't mean newbies can't use it: in fact, they'll find it very easy, indeed. Ulead gives you three ways to edit your masterpiece: the main video studio editor, the Movie Wizard and the DV to DVD Wizard. Using the movie Wizard is easy. When the wizard loads, you're given choices of "capture", "insert video", "insert image", "insert DVD/DVD-VR" or "import from mobile device". If, for example, you're inserting video you already have stored on your system, you just navigate to the folder where your clips are, highlight them, and the software brings them in for you. The next step is to choose a template for the movie. And this is kind of neat: the software includes a built-in ad zapper, so if you're recording footage from television, it finds the ad breaks so you can take them out of your final piece. 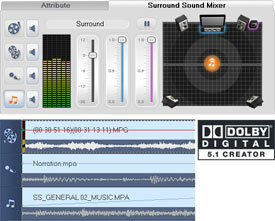 Once you've brought in your footage (which you can also drag and drop right into the work area from mobile devices), you can apply a filter to cut out camera shake that may be on the film, use an "auto enhance lighting" feature to tweak the image, and you can even add what they call "smart sound auto music". After you've chosen your movie's look from the samples Ulead provides, the software takes you back into the main studio screen and your clips appear as if by magic on the timeline. From there you can reorder them, add transitions between clips, edit the clips individually or do whatever else you want to create your masterpiece. I brought in six clips using the wizard and applied a template and by the time they showed up in the main screen all I had to do was click on the "play" button and there was my movie all ready to go – the clips were joined together automatically by very quick fades and even with a jazz musical soundtrack included. It was pretty neat, and very quick and easy. And if you don't want a transition, for example if you just want your clips to cut from one to the other directly, you can set the transition time to zero. The Studio lets you have as much control as you want over the creative process, but if you just want some really down and dirty editing this is a pretty quick and easy way of doing it. It's great for creating a fast demo, for example, for producers in a hurry. The software also includes overlays, you can have fade in or out or spin as they enter or exit; it's quite flexible and gives you a lot of power on your desktop. If you want to do matte effects like they do in broadcasting studios, you can create your own chromakey; the software features automatic background color detection and gives you the option to crop extra bits from the edges to help prevent the foreground objects from looking like they have a kind of a halo around them. A feature that I found particularly handy is its "smart proxy," which allows for real-time performance from midrange computers (such as mine, alas!). It does this by converting the HD video to smaller proxy files, automatically, to let you work with the smaller files more quickly before applying your changes to the final, high quality, resource intensive footage. It reminds me of film-based "work prints", where the producers could do edits, add effects, etc. without disturbing the original footage until everything's perfect – and has been approved by whomever the decision maker may be. And of course you can also manipulate your audio tracks, whether it be via adjusting their playback speed, applying audio filters or merely adjusting the tracks' volumes. Ulead also throws in some royalty-free music such as the jazz track I used, for those who can't afford to hire John Williams just yet. They're obviously fairly generic, but they're certainly better than a kick in the teeth – or a lawsuit. Like what you see here? Shop at TechnoFile's TechnoMart! Of course any production needs credits, if only so viewers know who's to blame, and the Ulead studio lets you use titles which can have different font styles, border shadows or transparencies. You can also animate your titles to fly and/or swing in; eight different animation styles are included. When you've finished your production you'll want to get it out to your audience so they can nominate you for an Emmy or an Oscar. To do this, you can use the software's DVD authoring features to create a disk – right up to HD DVD or Blu-ray standards. You can also select whether your disk format will use "standard" or widescreen aspect ratios, and choose from stereo or 5.1 audio. 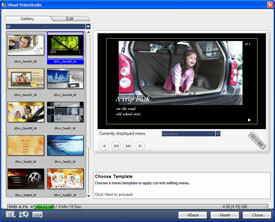 Ulead also gives you templates to create DVD menus. I didn't do a lot of production on the software but for my demo purposes it worked fine. It was easy to create finished projects and the software did everything it claimed it could do, even on a PC that's old enough that I wouldn't want to use it for serious video production. And when I output my work to a DVD it played back fine on my home theater. For what more could a Peter Jackson wannabe ask? 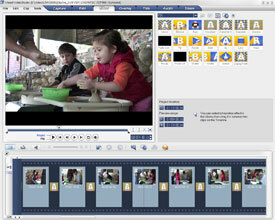 Ulead also sent me DVD Movie Factory Five, which they say is "the easy way to create video and slideshow discs". The software ups the ante on the Video Studio's mastering capabilities, letting you create standard or high-definition video or slideshow DVD's with "studio quality" personalized menus. It works well. The software lets you create videos from sources such as analog or digital camcorders, non-copyrighted DVDs, your PC's analog or digital TV tuner or your set-top box (such as TiVo or satellite receiver). You can add customizable menus and output the final product to HD DVD or Blu-ray discs as well as conventional DVD's. It also comes with media management software and the WinDVD 7 computer DVD playback software.